We recently faced a challenging teaching situation – accommodating 170+ individuals for the opening session of a highly interactive and student-led module, in a raked lecture theatre with a 150 seat capacity, poor acoustics and very limited access in and out of the seats. This first session of the Global Challenges module The World Today (currently designed as three intersecting courses – Analysing Global Progress, Collecting and Understanding Data and Innovating for Change) would normally proceed with a very brief introduction to the nature of the course, followed by getting the students up on their feet and working in large subgroups (perhaps 20-30 students) collecting and developing ideas about what a global challenge is, and then generating a list of challenges that all the students agree are important and worthy of detailed study. The module then proceeds with the students working in topic teams to develop a knowledge base around those issues and concludes with the students creating and mapping imagined future worlds. All sessions involve active learning, and the large amount of negotiated student choice means that the course proceeds in a slightly unpredictable but authentic manner each year. So, returning to this year. It is six days before the first session, and we have just learned that whereas we normally enrol between 60-120 students per year on this module, we have this year enrolled 156 undergraduate students and a further 10-15 PhD students who will work alongside the undergraduate students as co-learners, modelling their advanced learning and research skills and providing face to face support and guidance to the students making their way through the module. Meaning that we potentially have over 170 individuals needing seats. We also discover that we have been allocated SAFB34 lecture theatre, which has a capacity of 150*. It is a steeply raked lecture theatre, with rows of 10-12 seats butting against the wall on one side and with a single aisle on the other. The acoustics are poor, meaning that plenary discussion (the primary mode of action in our classes) is virtually impossible without a roving microphone and all the time delay and lack of spontaneity that that introduces. To be clear, we would not normally expect all enrolled individuals to turn up and attend the course – perhaps 80% would be a reasonable estimate, but that would still be 125+15 to seat, and the room would still not allow the type of active session we would prefer to run (and when I say prefer to run, I’m pretty uncompromising and I actually mean I WILL run even if drastic action is required). However, having said that, we had 98% attendance to the first session last year, which could put our numbers back up to 153+15, which we clearly could not seat. We considered insisting that the class was capped at what we considered a ‘safe’ number to run an active class in that particular room – perhaps 100 students, to allow students to move about the space, form and re-form groups and to allow the groups to interact with each other. But that felt rather like a defeat. *I have since counted the seats and there are in fact 174 seats, so technically, we would have been fine people-to-seats-wise. But the rest of my complaints stand – we would never have been able to deliver an active session in the space. So. Our first design decision. That evening we were thinking aloud, walking back to the tube – “well we clearly can’t do any activities with the students in the room, plus it is the MOST depressing lecture theatre to sit in, so we will have to send the students off and out to complete some sort of activity”. Rapidly followed by “…and I think we should tie the students together…”. At that moment, I wasn’t too sure why this felt important and I wasn’t too sure whether this said more about the learning design or me. But this idea stuck with me as we continued to think through the session. Problem: Given this is a non-compulsory course, not-for-credit, if we send all the students out in the first session, will they come back? Solution: We’ll need a prize giving for whatever task they complete. They’ll want to come back to vote and see if they can win the prize. So, by five days to go, we have the students being sent out of the lecture theatre, tied together in teams to complete an unknown task, and coming back (we hope) to compete for a prize. Problem: How do we make the exercise a meaningful learning experience that is relevant to our curriculum, and not just a random team-building, fun kick-off activity? Solution: Each team will complete a task related to the sustainable development goals (SDGs). We would normally use this first session to create our own, student-developed version of the SDGs which would then frame our progress through the rest of the course. But on this occasion, and without the opportunity for a plenary discussion at the start to begin building our ideas for this, we decided to use the actual SDGs as an initial framework. So the task would be to build familiarity with the SDGs. Now the SDGs are a bit of a bore to ‘teach’ and to ‘learn’. There are seventeen of them, which means that if you are going to talk through them, it takes forever. If the students research them and present back, it takes forever. And it is just a very boring ‘list’. So we would need to find a way to subvert the 17-item-list-effect. Question: Can you tell us about your most progressive or unusual teaching and learning experience- either as a teacher or student? Answer: Well, I was on a field trip and I had this idea to encourage the students to explore the concept of an anoxic ocean event by creating a tableau. Half the students would participate as actors and half would watch. It worked really well… (and then there was lots of very cool detail). This had lingered in the back of my mind, and with five days to go, we decided that the team task would be to create a ‘tableau’. There are seventeen SDGs, and we had potentially 170ish people, so it seemed logical that we would split the students to tackle one SDG each. And that they should do this through the medium of drama, and with the creation of a tableau (an acted or composite scene displayed in ‘freeze-frame’ or more officially, “a group of models or motionless figures representing a scene from a story or from history; a tableau vivant”). At four days to go, we re-discovered the issue of how dull a 17-point list would be. The session would obviously require a plenary closing, with the students able to view, review or otherwise interrogate the other 16 tableaux. Otherwise, we would have a group of 170 odd people who could talk about one SDG only. Which rather defeated the point of using them as a framework for the course. But even if we allowed the students to mini-present their tableau for one minute, and with one minute for switching over (those seats take some getting into and out of in SAFB G34), at two minutes per team, that would be 34 minutes of ‘list’. DULL. Solution: The students must be able to see/review all 17 at once and/or at their own pace. Now, normally, we would have created a learning product that could be attached to the walls and the students could have walked round and looked at them all. But there were no amenable walls, no milling around space, and absolutely no way that the students could do this with their tableaux. So, with four days to go, this was still an issue. With three days to go, I started to worry that although the creation of the tableau would require the team to really consider the nature of their allocated SDG, just reviewing the other tableaux would not communicate this same level of detail or conceptual understanding to the other teams. So we decided that the task would be two-fold – create a tableau and an information poster. This exacerbated the idea of review, with there now being 34 items for the students to review in the plenary closing. Suddenly, while sitting staring at the SDGs poster, I realised that we were essentially re-designing the poster. We were creating images that represented the 17 SDGs. And displaying them on a poster would allow all 17 to be viewed/reviewed at once. Eliminating the sequential list-like problematic of reviewing them one at a time. The students would photograph their tableau and email it to me during the class, and I would be able to somehow assemble all the images into a poster to be reviewed. Problem: What about the information posters? Would they need a second poster? Solution: We should GIF the images – the tableau and the information poster should alternate in an animated GIF. Now I didn’t really know much about GIFs and had a bit of a learning session to see if this was something that we could do. I figured out a way to make GIFs myself on my laptop and figured, if I worked fast, I could create the GIFs live in class. Problem: What would the students do while this was happening? Solution: Our students usually complete a Learning Pre-Assessment during the first session, and this would be the perfect opportunity for them to do it. It usually takes 15-20 minutes. So the students would be busy, I would be GIFing, but then what? Problem: How would we make an animated poster? Solution: WordPress can display GIFs. We could create a website that would display the GIFs on the homepage, looking like a poster. The students would be able to look at the website on their own devices and review all 17 GIFs, seeing both the tableaux and the information posters. I spent the rest of the day setting up the website and testing how to make and display GIFs. Back to the whole ‘tying the students up’ issue. I hadn’t forgotten about this, but was starting to be concerned about the legality of this, and the health and safety aspects. Not to mention the absence of a pedagogical rationale. But also, in the back of my mind, I had been considering a set of restrictions or tools that we could provide the students to make their tableaux. Initially, I was thinking along the lines of ‘things that make the world go round’. I had thought that maybe we could give them some money to buy a prop for their image, but the maths soon meant that I had abandoned that idea. Then while googling ‘tying teams together’ I realised that this was a valuable team-building tool. And I started to review our Global Challenges Skill Profiles. There was a possibility that this task could hit every skill in our manual if we fleshed out some of the team elements. Also, in this train of thought, I considered our upcoming name change from Global Challenges to Change Makers. It would be a bit of fun, but also would impact the team working, and carry a positive message. And better still, it made sense of tying the teams together. This wasn’t just a weird idea, it would be critical to the Change Maker ideals. Most of this day was spent preparing the Change Maker kits, and writing the task instructions. At this point, we also realised that making the GIFs ourselves was pointless. We would find a reliable and easy online converter, and the student teams would create their own GIFs and email the final GIF for inclusion on our ‘animated poster’. (this turned out to be a really good decision). There were a few last minute tasks to complete – such as packing up the Change Maker kits, putting together some introductory slides, making voting tokens for the prize giving at the end and making up a further ‘dummy’ kit for me to use for demonstration. I slightly underestimated the space and time required to make up 17+1 Change Maker packs, but by 3pm were ready for the Co-Learner briefing session and the class was officially in motion. We decided that it would be a pretty tricky task for the Co-Learners to follow the 17 groups around campus and offer help and support, and with the Co-Learners being a new team coming together for the first time, we decided to put them together as one team to complete the task alongside the students. It would be an excellent team building opportunity for them too. So, at 4pm we were ready in the Lecture Theatre, armed with our 17 Change Maker kits. As the students were filing in, they were very reluctant to move right along the seats to fill the rows, and we really had to keep encouraging them – “we’re going to be filling this room to capacity, please move along the rows and don’t leave any seats empty”. I just kept thinking – what if hardly any students turn up and I look like a complete idiot – if only five people turn up and you haven’t made a big deal about how full the room will be, it’s not an issue. If you’ve banged on about the number of people coming and only five turn up, that is embarrassing. But by 4.15pm, the room was full and we were beyond the point of no return. We introduced the module, situated this session in the over-arching plan and ran through the session outline. 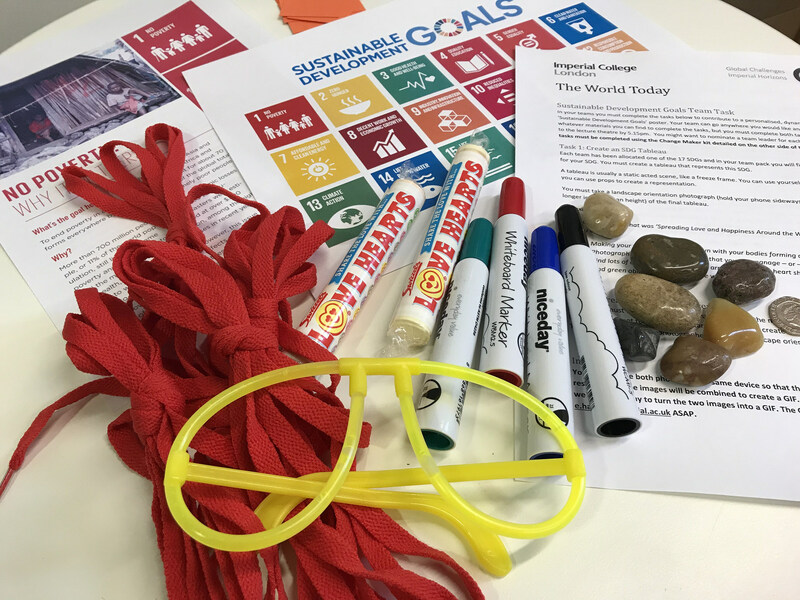 We then set up the task – re-imagining the SDGs poster with GIFs. We demonstrated a rather ill-conceived tableau (but it made the point), and described how the students should complete the team task. I took out the dummy kit and started to talk through the items. When I mentioned the Change Maker kit, a big sigh of ennui rolled out of the students, rippling from the front to the back. But when I whipped out and put on the glow in the dark glasses, the mood flipped, everyone sat up and we were back in business. I mentioned the Love Hearts and the students started to look hungry (always a good sign), and the coin for a coin toss went down ok. When I mentioned the pebbles and said that the students should put them in their shoes, there was a muttering of disbelief. They weren’t rolling their eyes, it wasn’t that. It was more, no one would ever actually do that in real life, though, would they? – type of a muttering. So then I took off my shoe and tipped out the pebbles that I had been walking around on all afternoon – and there was an actual gasp. The best kind. So with that, we pushed on to the shoe laces, at which point the students were so keen to get started it was almost hard to hold them back. We talked about the vote at the end, and described the numbered voting tokens in each pack – meaning that no team could vote for their own poster. We counted out the teams, using the rows and a little accounting magic, and the students all vanished. Luckily, we had thought about how to find out teams around campus (and beyond! ), and they were helpfully tethered and wearing glow in the dark glasses. The teams all took the task seriously and were hard at work when we ventured out to offer any assistance ten minutes later. While the students were out completing the task, we were alerted to a room-booking clash, when we were asked to vacate our non-ideal lecture theatre at 4.50pm. Luckily, SAFBG16 (next door) was vacant from 5-6pm, so were able to almost seamlessly move all the students possessions and our materials into the adjacent lecture theatre, and post two people on the doors to redirect the returning students. Not ideal, but no big drama. At 5.15pm, all the student teams returned to the lecture theatre (next door), and we had projected on the screen the instructions for how to use Giphy.com to convert their two photographs (tableau and information poster) into a GIF. The students were also completing their questionnaires. My email started pinging like crazy as 17 links to 17 GIFs started arriving (actually more than 17 as some students were revising their images and sending new GIFs just to keep me on my toes). I began dropping these GIFs into the pre-prepared website, and the website URL was up on the projector with the instructions, so the students could begin reviewing the GIFs as they were populated on the website. After making the first two inserts, and realising there were 15 more to go, I started to lose faith that this was a good idea, or even a possible idea. But I kept my head down, the co-learners and co-lecturer were circulating and there was a pleasing murmur of discussion about the various tableau/poster combos. Here is a link to the website so that you can review the GIFS. One team had a little difficulty with the instruction that all images must be photographed in landscape (I even included the instruction to turn the phone on its side while taking the photograph to make sure that the captured image is longer in width than in height, but nevermind), so their GIF refuses to be animated and we will correct this in class next week. We constructed a big voting matrix, and then all the students brought their tokens down to vote. So prizes awarded, the class ended and we came away very happy. We could have compromised on our learning values and delivered a lecture or a minimally active session, but are very glad that we didn’t. We had enormous fun designing this session and working through all the issues that we encountered. And we ended up with a session that exceeded our intended learning outcomes – both in terms of content and skill development. Just returning to the skill profile that we have for our courses, we’ll just consider how this single session worked out.